Clear your calendar - It's going down! Flyer Reset kicks off on November 28th, and you're invited to take part in the festivities. Splash HQ (122 W 26th St) is our meeting spot for a night of fun and excitement. Come one, come all, bring a guest, and hang loose. This is going to be epic! 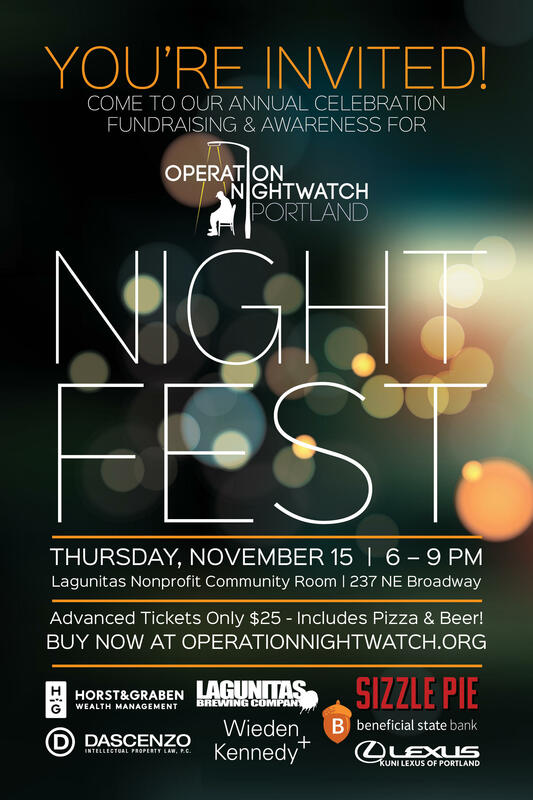 Please join us for Operation Nightwatch’s 6th annual fundraiser, Nightfest! Come see what we have been up to over the last year and what our plans are for 2019. The evening includes pizza (vegan options available!) and salad generously provided by Sizzle Pie. Tickets are $25.00 and include food and 1 drink token. Additional tokens available for purchase. All proceeds from the night's event and silent auction will benefit Operation Nightwatch.